On Friday of last week, Level 4, 5 and 6 Graphic Design and Graphic Illustration students were tasked with selling a colour. We only had four hours to create a campaign/presentation to sell this concept and then we had to present and propose why it was best. Using anything from interpretive dance to photography and illustration to design. Me and my team were given the colour Brown. The fact that the colour doesn’t even feature in the rainbow, and often is thought to be very dull and neutral left us with a task on our hands. I was given some responsibility for the team and all levels participated in the project. As nervous as it may seem being placed into a group with people you don’t know and then being expected to come up with creative solutions to sell; I was impressed by how the whole group got stuck into the project. The process really needed to start with the ideas generation, something we as designers thrive on. We all aimed to get as many concepts down as possible. The group as a whole started with some of the more obvious solutions for the brief. I advised the group that it’s about thinking outside of the box of ‘a presentation’ and starting to think ‘How can we sell a colour?’. After multiple ideas, and a little bit of banter between myself and my peer from Level 6; we decided that we needed some comedy in our final outcome. The concept for a TV gameshow was one of the strongest ways to really showcase the colour, but I personally questioned the idea, as it wouldn’t explicitly sell the colour. From this we decided to use adverts in between the TV Gameshow. What would these adverts be?–Who are we trying to sell them too?–What products would we incorporate in the adverts? were some of the questions we all asked of this section. As a group we had explored the many things that are brown, such as chocolate, coffee, hair, Derren Brown, Gordon Brown and mud, to name but a few. These now were all fair game to being sold as part of the adverts package we were to produce for the presentation. Having the concept for both the gameshow and some idea for the adverts, we aimed to make them all happen with the 8 people who were in the group we were able to split into two sub teams and focus on the branding and planning for the games show and the other group for the adverts. We felt for the gameshow, we should take a spin on titles that were on the TV now, things like Who wants to be a millionaire?, Pointless,The Chase and The Million Pound Drop; being a few we thought could work. In the end we took on the idea of Who wants to be a millionaire? 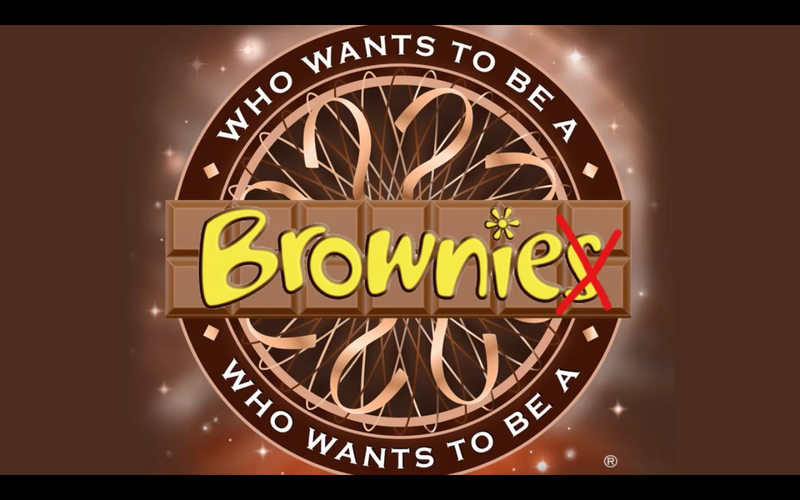 but changed it to Who wants to be a Brownie?. Our logo for the gameshow. They were shot on an iPhone 5 and edited with Adobe After Effects, with the exception of the Derren Brown advert. I feel that leading a group is a strength of mine, but in this instance it was about allowing the group to breath and get their own creative cogs going in the project and this was about making group decisions; ones which would ensure the project worked. So with 6 groups all involved in selling colours the black, red, blue, yellow green and brown. The groups all presented in a variety of presentation styles, some used slides, others used a poem, and the winning group which was unfortunately not ours, was the Yellow team who used the concept of an airline safety talk to sell yellow on ‘Yello There Airways’. I was really pleased with the whole project and really enjoyed the process we undertook in the 4 hours we had. Blink auction website goes live. matttfinch23 on Form Follows Function. irregularroy on Form Follows Function.